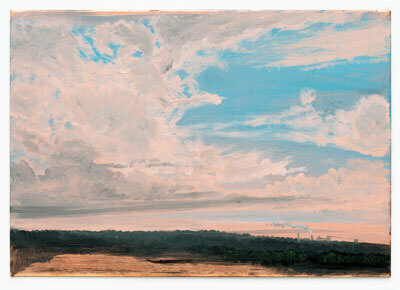 American artist Keith Jacobshagen has made a significant career out of painting an empyrean Nebraskan landscape. For an encore he has made a visual statement about that experience, and it’s currently on display at the Bemis Center for Contemporary Arts through July 30. Keith Jacobshagen: A Golden Year is a conceptual installation of 3.5 by 5-inch oil paintings on copper sheets that feature, except for three images, his familiar rural Nebraska within a 60-mile radius surrounding Lincoln. Only this time around, instead of concentrating on one imposing landscape, Jacobshagen offers 365, a year in his life, 2010, when he painted virtually daily from observation, photographs and watercolors as well as memory and invention. His aesthetic hasn’t changed dramatically even when working in miniature. But the drama in this exhibit is heightened by the installation as conceived by the artist and curator Hesse McGraw and masterfully hung by Matt Lowe, chief preparator. The images are placed side by side chronologically at eye level in the first gallery beginning on its south wall. Jacobshagen’s traditional low in the frame horizon line is kept constant giving the illusion of being with the artist on assignment with a 360-degree view of his landscape. But instead of being on site, or even being in one or many of his paintings, we are instead inside Jacobshagen’s head. This is his vision of a world we often take for granted. A Golden Year illustrates 365 times that golden hour, at dusk, between daylight and nightfall when time seems to stand still and demand one’s attention to the horizon and away from all things man made. If you do, you will see two things about Eastern Nebraska reinforced in his imagery that distinguish it beyond even the two states that claim it as their own: the Big Sky Country of Montana and Arizona’s rep as the Sunset State. Yet, this series is neither mere documentation nor touristy postcard. You may have favorites, you may even check out the weather on your birthday in 2010. Chances are you will discover it was pleasant in your honor since according to Jacobshagen’s optimistic visual record, only about 44 days ended with threatening skies. Overall though, no single work is meant to stand out. The installation as well as its viewpoint is greater than the sum of its parts or replication. It would be romantic to imagine the artist perched daily on a hill overlooking the Elkhorn and Platte valley, facing his easel, palette in hand, as he struggled to capture the scene before him. Though considerable time was spent “in the field” observing and sketching, Jacobshagen drew upon other faculties that raised the bar of illustration to the level of visual poetry. At his Artist Talk in April, he and McGraw discussed the motivation and vision of A Golden Year. The consensus was the Jacobshagen, who paints virtually daily in his studio, creates an “emotional landscape” where the reality is as fictional and personal as it is factual. Imagining him painting in oil in the solitude of his studio reminds one of poet Wordsworth who said that “poetry is the spontaneous overflow of emotions recollected in tranquility.” Individually painted, Jacobshagen’s landscapes are significant, not because of what they replicate — though they are remarkably “real” on close inspection — but because of what they suggest and stir within us of similar times and places deep within our memories. This impressionistic style is as much about mood and the imagination. If neither are engaged or indulged when viewing this exhibit, perhaps it’s because one’s time in nature in Eastern Nebraska is mostly a trip between Lincoln and Omaha on Interstate 80. Not so with the artist. His connection with the spiritual vastness of his cosmos is the low horizon line, which characterizes most of his art, large or small. Jacobshagen says his father the pilot first made him aware of the horizon because of its ability to provide an anchor and reference point. He noticed this for himself later while riding in a train car. The exhibit effectively recreates this sense of stability while in motion by having the viewer rotate nearly 360 degrees around the gallery. The viewer will also note that Jacobshagen remains a respectful distance from his subject all the while de-emphasizing the land between him and the horizon as well as his place upon it. What is on the horizon or beyond it doesn’t seem to interest him. His vista vision doesn’t include an Oz or a yellow brick road to approach it. He’s content to simply acknowledge nature and one’s relatively small part in it and gaze at the feet of the vastness that holds him in its grip. Despite Jacobshagen’s spiritual connection to nature he says he is pragmatic enough to acknowledge that land is “multi-purposed. It is equally important to society for agriculture and industry as well.” When he looks to the horizon he sees both “grassland and farmland.” And lately, he has begun to add industry and suburbia with new sketches allowing how suburban tracts have been eating up the landscape and radical changes in farms have impacted the environment. Yet he remains non-judgmental about these changes on the horizon, so to speak, and quietly accepting. From a distance, these man-made markings all look remarkably alike. Get closer and you will notice the Herculean effort on his part to distinguish silos and outbuildings from homes, chimneys and factories in miniscule fashion. That the artist lacks an overt socio-political POV may trouble some but his detached one-point parallel perspective is consistent with his apparent belief that under the heavens there can be stability and room for all. To complement this, in spite of the occasionally threatening gray sky, Jacobshagen bathes all beneath it in the same palette of warm azure blue and rose pink. That, and an ethereal coppery glow that subtly shimmers through during that Golden Hour, “a time between dogs and wolves,” Jacobshagen says, when an artist makes peace with the duality of nature and man and creates a landscape of his own.